Dear fans waterways of Europe. For many years, East Europe was a forbidden zone for tourist trips and hardest were those who dared to try their vessels to sail inland waterways of the former USSR. Thankfully, times are changing and every day is getting better. Many strict rules are repealed. 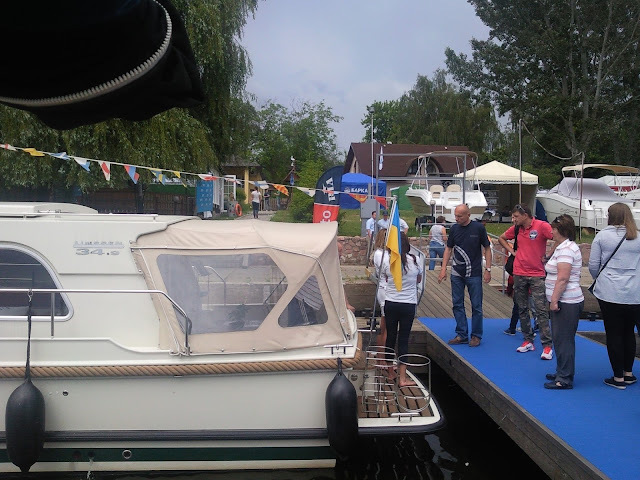 Thus, in 2013 opened the door to the tourist sailing inland waterways of Ukraine. For all countries of the European Union as well as for most European countries do not need visas and entry to Ukraine is free. This significantly facilitates the travel and stay of tourists. The biggest obstacle is the 2013, already mentioned above, also abolished. For sailing on their inland waterways do not require special permits. By 2013 it was a requirement that on the vessel next to you, be a citizen of Ukraine or the so-called Locman or Pilot who would manage your boat. To summarize: Ukraine is open to all small and large tourist vessels and stay in Ukraine is free and sailing its inland waterways. Whether you manage a canoe, kayak, catamaran, sailboat or motor various small and large vessels Ukraine welcomes you. This little guide is a modest contribution to encourage people to engage in still quite an adventure sailing Ukraine and discover a new destination that is within reach of all Europeans. Once so distant now at your fingertips, there just next door. Whether you live in the Scandinavian countries, central, western and eastern Europe access to Ukraine to recommend the system via the Rhine-Main-Danube. It is certainly possible and access to vessels from the Mediterranean directly to Odessa and Kherson but most will opt for inland waterways. 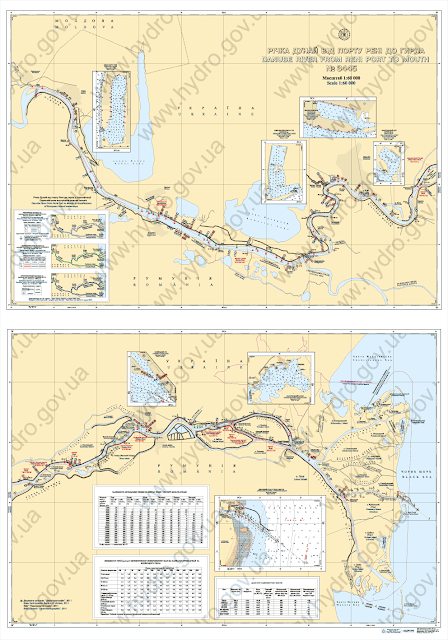 Of the many rivers in Ukraine to be explored and presented to tourists, this guide tries to present you the main artery of Ukraine-Dnieper. Sailing the Ukrainian part of the Danube, the Black Sea and Dnieper opens new acquaintances, expanse, aspects and enriches the soul and body. Thus we become better people and share experiences with local hospitable people. Enjoy the ride. 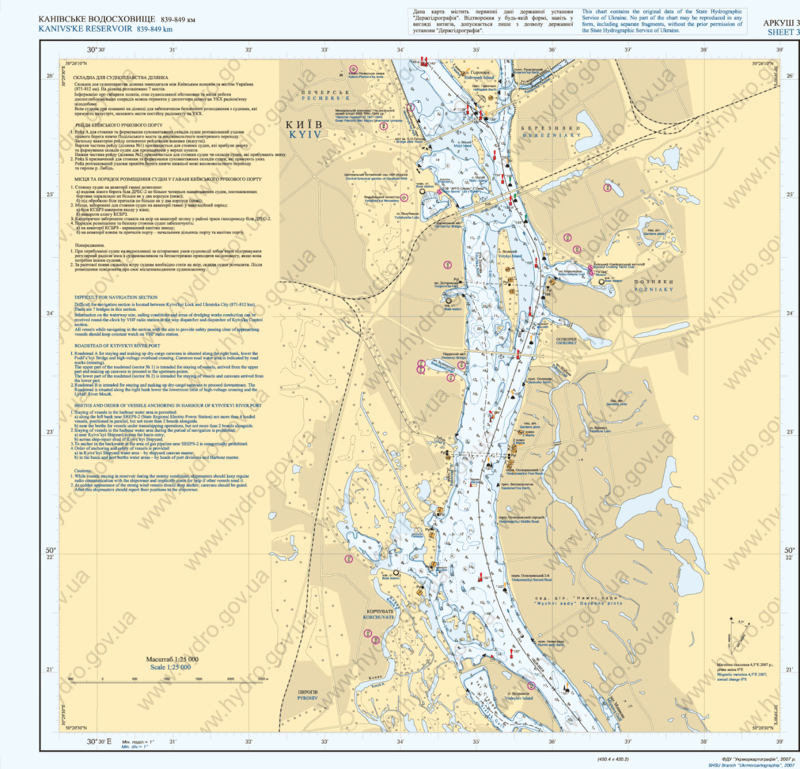 There are many guides to navigation on the Danube from central Europe to the Delta and on to Istanbul, Athens, Nice and make a big circle over the Rhone-Rhine canal.Up to you to decide who will guide and experience of navigation on the Danube used. Every year many tourists navigating the Danube and destinations, ports, marinas, gas stations, historical curiosities are presented in these guides. So as not to waste any time, I will move immediately to the Ukrainian section of the Danube where the adventure begins. Very few tourists visit the Ukrainian part of the Delta but every day will be increasingly more visited. Although the stay and navigation in Ukraine available, many bureaucratic rules have not yet been abolished, the registration and entry to Ukraine vessels still complicated. My experience sailing from 2013 and 2016 will try to help you easily demonstrate how to navigate in Ukraine with pleasure. Establish contact with the Agent / Agency about your arrival at least 24 hours before your arrival. Agent will need for this service charge 37 usd, and friendly people from the agency will help to purchase significantly cheaper Ukrainian fuel, food, cell phone cards .. and everything you need in Izmail. It is forbidden to refueling in plastic buckets at all petrol stations in Ukraine. Therefore, it is necessary to provide the metal before traveling and certainly that is most convenient to buy fuel to water stations which currently has few and below explain where they are. Of the many agencies in Izmail I recommend the agency TRF Agent trf.com.ua/en/services and contact via their website.Your intention of coming further agent forwards administration Izmail port and border police and the Coast Guard. It also will transfer agent and port access rules, rules of communication with the head port that can be telephone and radio station on the 9:16 channel. Note: Many other agents will try to make you force a significantly higher price services and even seek and huge sums of money. Therefore, I recommend this agency and contact and negotiations prior to the arrival and to call on my experience .. It can be reached immediately in Reni, where it would be good to establish a visual and personal contact with the Coast Guard, which is anchored at the beginning of this port. This will lose a bit of time but will be released fears introducing friendly and curious border guards. Do not be afraid of the first meeting, although it will seem that you are not welcome. Believe me, they are just surprised by your arrival and immediately after that follows the story because someone always knows basic English and your navigation is enriched by a new experience and also safer because it is always better eye contact rather than by phone, e-mail or radio. Kind border guards from Reni will explain it to the port of Izmail, you must not set foot on the soil of Ukraine and will try to explain to you and where you can safely dock and in my case, if you sleep for days you can not make it to Ismail. There are many points Coast Guard on small rafts and be sure they wave and they will you. At 44 miles there is little point and their distinctive tourist complex where you can safely anchor. Sign carrying out formalities in Izmail you are free to enjoy and explore the Ukraine.Immediately after Ismail is a private oil company Triton harbor. If you need larger quantities of oil, diesel or gasoline, politely ask people to help facilitate the mooring and to assist in the procurement. In my case twice and aided and warmly recommend them. Be friendly and with the local fishermen who can supply the fresh fish of which is allocated Seljotka. Seljotka the fish full of iodine, which can be eaten without heat treatment. It should be just fine salt and leave so that time. It is impossible to pass the Danube Delta that we have some of the fishermen are not gifts or sold favorably this first-class fish. When contact with the fishermen do not be afraid. Although look poor and rough, these fishermen have an open soul and believe that it will delight any tourist. In the Danube Delta live Lipovljans people who are oldbelivers. Banished long ago by the Empress Catherine the then deserted Delta, have remained true to their faith. Coffins with two fingers and build a huge church even though disadvantaged. The stories that are dangerous to deal with piracy or are just plain nonsense. You will recognize them by the characteristic black boat that they call paddling boats. Settled by the Romanian and Ukrainian Danube Delta and the area around the Delta. When you approach these fishermen and fish gifts which will be often, be sure to provide a travel some small gifts in return. In my case it were sets of small hooks of various sizes. I brought them 26 and all shared. It is recommended that you bring something from your end. For example, a brochure of your city, small pendants, stickers and the like which you can donate in return and you can stay for a long memory of the unusual encounters. Slowly you approach these people, reduce gas, fasten them, tell, tell where you are, laugh, take a picture .. enjoy. Enjoy, and in the Delta to the fullest. Each Delta is magnificent but the Danube Delta with its magical islands, rich flora and fauna, extraordinary people, moonlight, the scent .. When you wave to the shore and you slow down and see the distinctive call to drink alcohol, which consists of tapping his fingers on the carotid artery, accept the call.Many people called me that way and I decided to explore what it means. I met the Kilij Nikolayevich and Mihajlovic. Fishermen, Lipovljani who invited me to eat and drink in their Dacha on the Danube. Characteristically for Lipovljane that name is not as important as the name of their father so both it and addressed. I tied the boat to their harbor and soon we began to communicate in English. We did a barbecue, meet me with the local people, according to grow grapes and other things. We started to tost with local wine Navak, which has up to 40% alcohol which is a very high percentage of wine. But taste is distinctive and resembles a semi-sweet wines. We spent an amazing night and Mihajlovic's brother showed us Kilij the car where prevail houses with gardens and concrete streets. Surprised by the hospitality calmly continue journey by Delta. In Vilkovo lending many channels that I wanted to explore. Unfortunately in these barriers, fences and the like. However, each house has its own channel where the local boats moored. Between the spring of 2016 he was banned from fishing but miss the meeting on the water. In one Dunavac meet a real host, Jovanovic. She has invited me to be his guest in a tourist hut which attracts many tourists from Polish, Germany, Ukraine. The roof of the cane he asked communicative fry Evgeny a woman Ala us prepared local specialties. Soon we showed Delta with his son Alyosha and traditional boats we look around nature. It is so hospitable that he would not let me continue my journey but to be his guest for another day. In its tourist oasis can relax in comfortable accommodations up to 15 people with socializing with fireplace, fishing, hunting, boating. 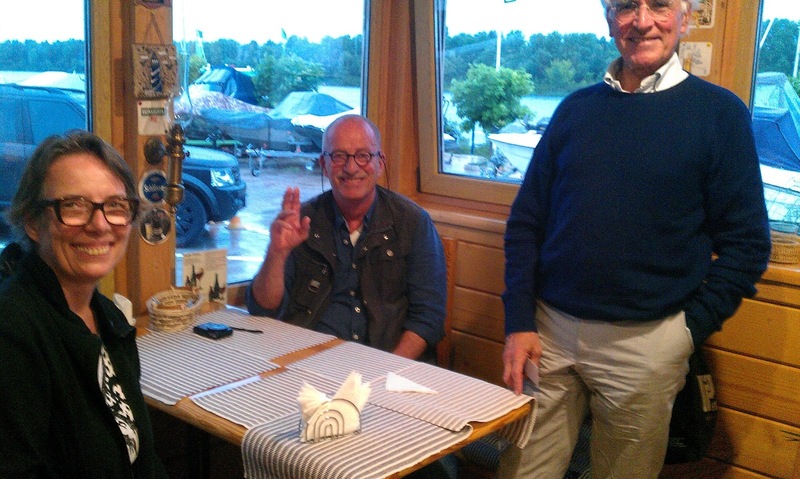 As throughout the delta approach is only possible by boat and Jovanovic relishes, hosts and their guests warmly send off a boat. In my opinion the right way to comfortably explore the Delta with a guide who knows the customs and is ready to enjoy this and discover Delta. On the Black Sea is coming from the throat Ochakyv closest Odessa. 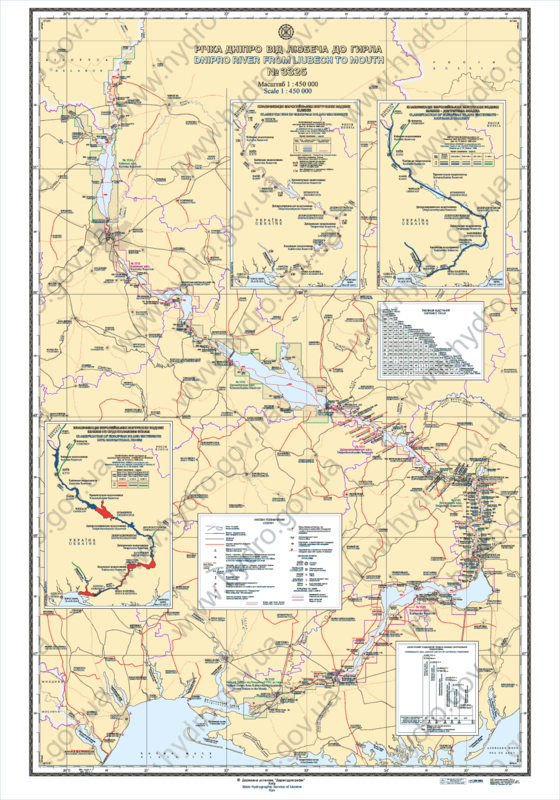 From the exit to the sea from the first port of Zatoka has over 100 kilometers, the start time is planned for early in the morning. Larger vessels can effortlessly arrive to Odessa and kayaks can make and break the many sandy beaches. Using contemporary forecasts in most cases we can predict the size of the waves and the speed and direction of the wind. From experience sailing in the spring when it's cooler but much more stable weather. I mostly use Windfinder and yr.no forecasts. 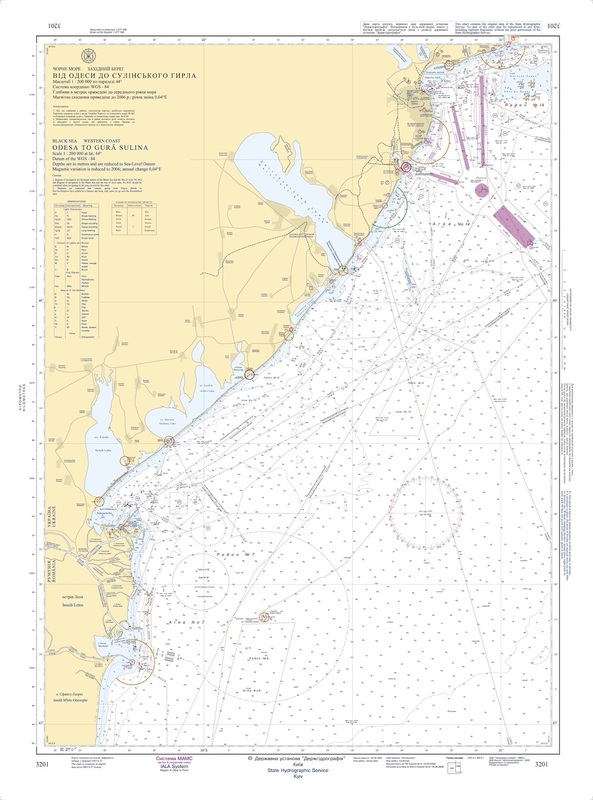 Note: Each access to the sea or large water reservoirs on the Dnieper dangerous.Before the start navigation to any vessel should be informed about the weather. The author of this guide is not responsible for the consequences caused by reading this guide. The vessel is my 5x2m. with green swordtail that I use in side waves. It is equipped with two motors, paddles and life jackets safely sail in the wind up to 10m / s, although avoiding any wind stronger than 7m / s. I sail about 400 meters from the shore with a lit radio station and involved telephone. I have constant communication since Ismail with the Coast Guard who knows my phone number and every night asking me about the current position and future plans. 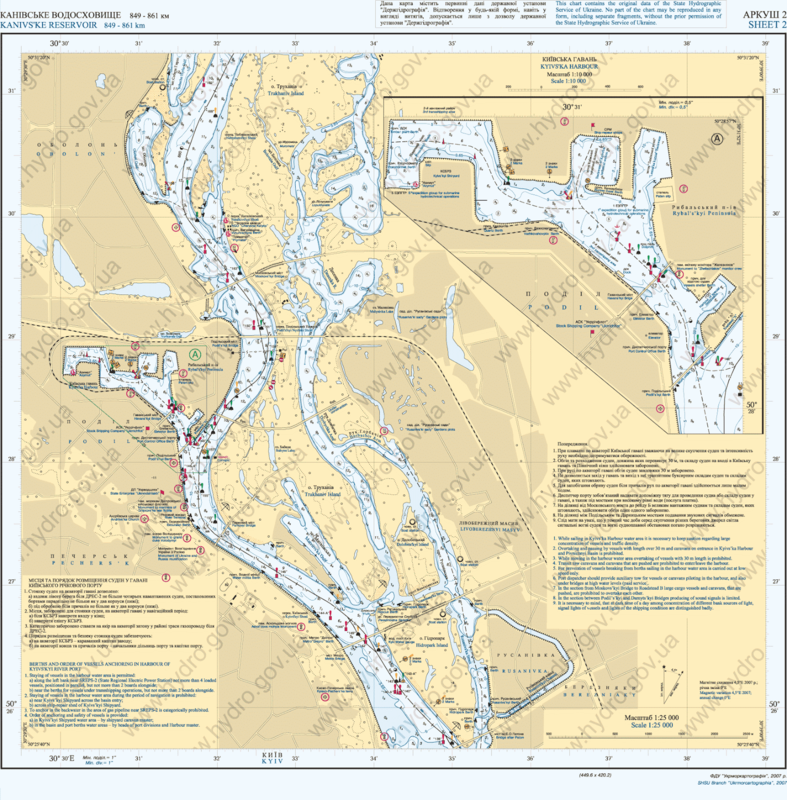 So the obligation to the Delta of the Dnieper. Another of the old bureaucratic rules. But this is possible and to look positively because emergency Coast Guard always knows your position and can help you. After all-day navigation and mandatory meetings with dolphins arriving in Zatoka, a small tourist town near Odessa. There is a need to contact the Coast Guard, which will allow the passage under the bridge. Immediately after the bridge on the right side of International marina and resort testified 80 testified in Ukrainian means harbor. In this tourist complex can berth vessels of all sizes in a safe and modern marina. The whole yacht club testified 80 enables pleasant stay in all sorts of accommodations.Starting from small cottages intended families to luxurious suites. The management is very young and attentive and will try to fulfill your every wish. Flights organize a series of parties and events for young people along the coast and the pool and provide a peaceful holiday for those who require it. www.prichal80.com They offer and adrenaline sports, fishing on the high seas and the Dniester delta are protected from the weather so that depending on the bad weather at sea can be enjoyed at Liman Dniester and vice versa. Here you can provide fuel, food from many markets and do all that is necessary for your vessel from small service to serious corrections larger vessels. A large port city that I jumped for the second time due to the small vessel trying to cross the more kilometers during the day. This interesting town is definitely a recommendation to visit for an interesting history, architecture, people and offers comfort for sailors and refueling with water. There are several yacht clubs. And after the Gulf of Odessa there club of local rich people who offered shelter and welcome. In my case I dropped anchor after the island of Lieutenant Schmidt in Liman near Ochakiv, where there are also ports and tourist facilities open to tourists. I would recommend a visit to the island May Day, the former naval base today completely deserted island. 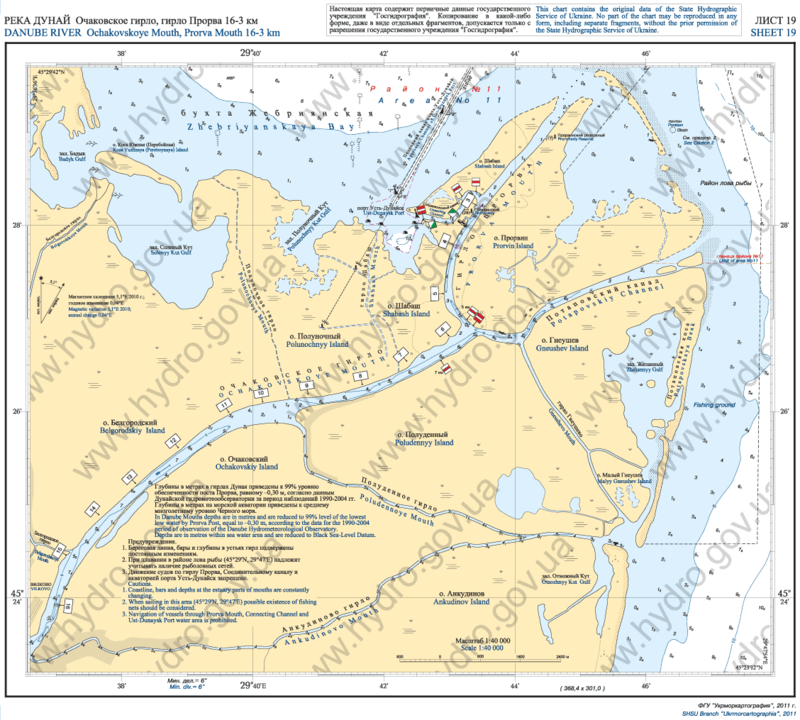 Away from Ochakiv where she also sails to port Dnieper bay where the water is warmer. The Delta can be reached with a view to two impressive lighthouse. 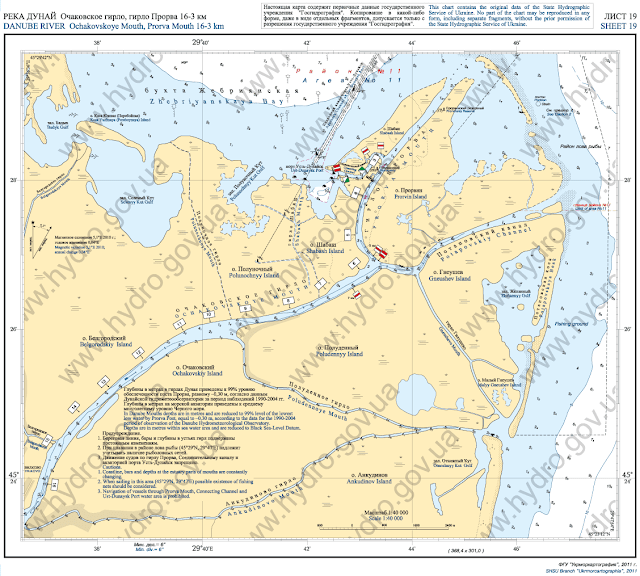 Well-marked waterway takes you to the left bank to the entrance of the Dnieper. Small vessels is also possible to enter the Dnipro its main throat. Depth is below 50 cm and the first thing that will impress you in the Dnieper Delta Providence River.Unlike the Danube, Rhine, Vistula, Don, Volga, Sava, Tisa and many other great rivers of the European continent, so far for me is the most impressive of the Dnieper for its clean water. Soon, if you stop and drop anchor in a small channel you will see that the water is transparent, up to two meters deep. As if you are in an aquarium where you can watch the plants and fish in Completely transparent water. Admit a big surprise for such a large river. Although local people are not impressed by this fact and often speak to the Dnieper River is dirty, to me this is the most left a positive impression. I never dreamed I so large river can be so pure. Indeed years may, in extensive water lakes to turn green because of algae or the length of the entire flow from the mouth to Kiev after I could always see your propeller and more and in the banks it's always been cheerful to see the clear water and sand. Throughout its course Dniester is tamed large dams similar to the river Main. Cruising speed is and the cannula along the whole of Europe. 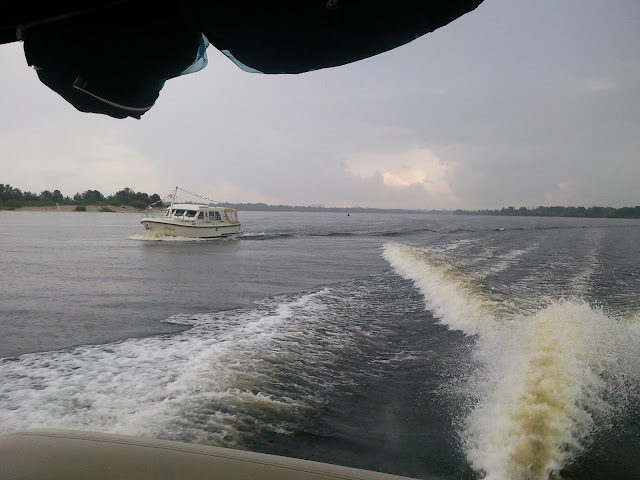 This means that navigation can be a quick and cost-effective and is not a big difference Navigation upstream or downstream.Sailing from the beautiful Delta to Kherson, the first major port and city on the Dnieper, passing by a large number of different weekend house. Quite a little Disneyland, which makes navigation a lot more interesting. A large number of different houses with intuitive solutions for lands, benches, docks, construction methods ... Sailing along the coast you get to know the characteristics of the local population and create beautiful impressions. 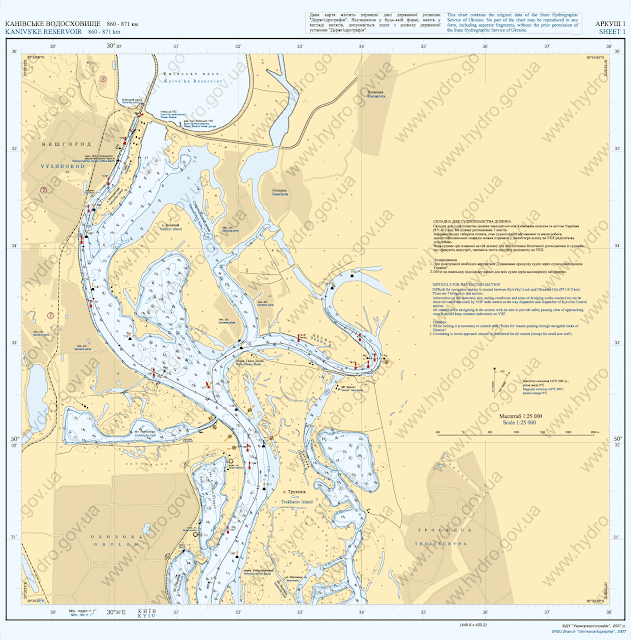 In Herson you are not required to log in or recommend sightseeing with a history dating back to BC with several yacht clubs where you can supply and folders Dnieper. In Nova Kakhovka after sailing around the peaceful Dnieper is full of small secluded town house and anchoring, you arrive at the modern complex of rounded Maxim Marine. There's everything you need for a modern and demanding guests of the luxury hotel, the International Marina, service center, tennis courts, restaurants ... www.maxmarine.com.ua Tourists from smaller vessels are also welcome here and the hosts will help you in every situation. It is characteristic of this place is something regulated source of drinking cold water, which gives a special charm to this place. After New Kakhovka is the first lock on the Dnieper. About the prices of translation on the Dnieper the vessels with foreign flag, you can get information on the site www.ukrvodshliah.org.ua and on the state of waterways in Ukraine on the site https://ukrris.com.ua/ As you can check the translation of foreign vessels is considerably more expensive than local and the first two locks New Kahovka and Zaporozhye with paid tax in 2016 cost around 300 euros. I had to find an alternative crossing the first two locks. On the other four locks it is necessary to pay the $ 40 it is much more normal price. I would note that due to inflation this amount halved and that in pricing for translating the Dnieper 2014 years was necessary to pay around 1,000 euros to go through all 6 locks. Another nonsense bureaucracy to be sure I was abolished in the future. Because as you'll see people you can switch to a trailer in most cases free of charge because they want to help and improve picture bears on Ukraine as a country that is not full of thieving already full of nice people. Also whoever has formed these prices did not have in mind that each individual evakuator or towing service crane can lift boats up to 4.5 tons and switch over to the lake for $ 20. Also in the formation of these prices no one thought that the example of 300 euros in Ukraine can buy a used trailer and an old Lada and I do the work of translation. Fortunately hereinafter will videtii how ordinary people cope and how there is a strong desire to bring the old regulations to normal. Thus, thanks to the good people of Maxim Marine overcome first bureaucratic and legal obstacles on this trip. Instead of paying more than 130 euros for the service locks New Kahovka, I have switched their trailer in a large lake for free. Thus, the people showed how sorry they are that there are such rules and are ready to show how much Ukraine wants to host and welcomes all sailors and they are ready to solve all the obstacles. Once again thank the people of Maxim Marine. I am sure that the future tourists to help and be of service. This game is all that this great duties be eliminated directly in the Ministry in Kiev and very soon. After switching to Kahovske lake Ukrainians also called the sea continue north.Nature fascinates. I stand on the left bank and lending a great deal of the Gulf that provide shelter and small and large yachts because they are very deep. After a full day of sailing and enjoying nature refer to the Bay Zolota Balka. Soon approaching local fishermen and invited me to join them. Real šašljik, the local name for the barbecue. Incredibly welcoming, open, positive and smiling. Like one big family. We all know each other and come to them and friends from the neighboring town on vacation. They offer me fish, fruit, food, beer, vodka, and we spend an unforgettable evening with socializing and stories. Such fishing town and commune has all the Dnieper and dating back to the Soviet Union and now a lot less work but kept the spirit of old times. The next day I move or storm caught me and I was using Google satellite maps found shelter in a small marina in the Marjan where I spent two days. There I met the dude Sergei who is the owner of a tourist complex in construction. Immediately shows me the city, construction plans and expansion of the marina. Take me out to lunch, to the church, shows the weekend, giving bacon and homemade eggs that I ate the next few days. It gives me contact Kosta who greeted me in the next big city Nikopolje. In Nikopolje a well organized marina protected from wind or a whole area is quite exposed to the wind and waves, and should be taken into consideration weather conditions. The club has lots of sailing and some cruising and to Croatian and Baltic.Many people speak English and the director of the marina is attentive and show you folders and organize the welcoming of the next big marina in Zaporozhye. But Costa and his wife Irene proved to be a real host to me generously. Wonderful people all at the marina. As the voyage after Kahovske lake ended leads to the calm waters, the narrow coastline, crowd beach vacation, small landscaped camp with landing, hotel complexes, forests, ostrvima..do big city Zaporozhye. There negotiable come to the club testified 7 where hanging out with Seryozha who along with the director of marine transport is organized through other obstacles in the Dnieper former Lenin lake. Lock in Zaporozhye is from one of the greatest difference in altitude. Its one chamber shifts Prov into the lake with difference of almost 40 meters high. For this service looking for 150 euros. So again help local people that we provide a smooth ride on. I meet a very open young people with care to hear about my trip. The next day I transferred to the lake and the local television giving an interview about the impressions of sailing around Ukraine. In the modern club Zaporizhstal http://www.reikartz.com/en/hotels/zaporozhye/rest/ at the beginning of the lake down my crane and friendly hosts we offer free accommodation in one of their bungalows. As I went on I enjoyed the nature. The lake is much milder than Kahovskog, also with a lot of bay that offer shelter from the storm. Appear new megalomaniac cottages or country houses and the middle class. Monument of World War II leaves no one indifferent. Coast in some places are rocky and do not resemble the Scandinavian countries and appears and forests of white pine. As you approach the coast Dnepropetrovsk become narrower and more pleasant. Coming in millions city of Dnipropetrovsk. The city with a large infrastructure for sailors. There are several clubs, harbor for luxury yachts in the city center, as well as smaller clubs and with great opportunities for boaters stay right at the exit of the city bartolomeo.com.ua/en.The city next to the beautiful center has to stress position to say with great beaches, parks, and recreational facilities on the water. The first time I see people paddling kayaks with consumption in large numbers and many people are involved in sports on the water. Dnjeprodzerinsk has dirty metallurgical industry and the only disadvantage for the eyes along the entire course of the Dnieper. Before the next lock coming to town Dnjeprodzerinsk where I first sought assistance with translation, which is now $ 40 per lock. 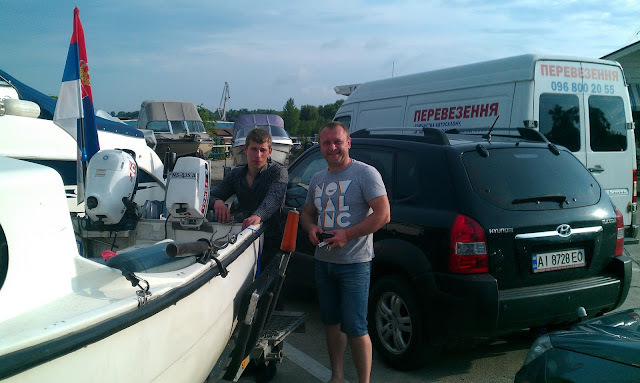 The club Wool help me and the third time transfer boat in Lake Dnjeproderzinsko free. Several people helped me and this is my namesake Vladimir says that very moment has a trailer and jeep and transferred me free in the lake. By the way we ojašnjava as New Dnjeproderzinsk created after the construction of hydroelectric power plants and from the air even speaking settlement in the form of Cyrillic letters USSR. Dnjeproderzinsko Lake, Pravobrezye and Borodejevka. The lake also provides shelter from the bays but to a lesser extent than the previous two. I find interesting place is nothing like the Ukraine so far. I'm in Pravobrezju in an abandoned quarry that is as bay. Granite walls and around mountain herbs. The house is made of stone and whole with stone roof. At the entrance gate to the port also of stone. Outside, a few fishermen's houses, everything is open, but not a soul.Even outboards run out and there is no. I'm going to the house of stone. It's full of the courts, a small fire but no people. As you come once a week and after all leave without fear that they will take a little. They're not even a dog to warn the people. This is the most unusual place during the whole journey. Next come to the base of Odiham Borodejevka. These are the resorts from the time of the USSR, which are built of wood and have a soul. They are intended holiday workers and very nice this place is well maintained. Here we give the Jura to be tied to his pontoon and in his bungalow gives me a bed, shower and saves me dinner and In the morning breakfast. Jura is a few days ago became the grandfather and positive personality. How do I approach Kremenchuk large lake ends and the coast are hospitable.Before Kremenchuk I slept at an extraordinary place. Small campsite with pier also with transparent water. In Kremenchuk there are two clubs and a gas station on the water. And here I have tried to organize transport over the next lake or I came in early on Saturday morning and there was nobody there. Guardians of both teams are very good people who invited me to be their guest. I continued because in Ukraine can stay only 30 days, so leave the country for 30 days and come again for 30 days as well as for the majority of tourists who do not need visas. After Kremenchuk there are three clubs and Poseidon www.yachtclub-poseidon.com.ua provides the same as every major European nautical center. From Kremenchuk to Svetlovidska should be required to keep the waterway because any deviation can result in shock on the wall. I came to Svetlovidska following locks, announced the radio station that I wanted to go and lock dispečerka spoke to me in English. Soon I was tied at the entrance to the lock and have organized a ride to the bank where I paid translation for Svetlovidsku and Kanivsku lock. Very friendly people and the staff of the locks have made this trip much more enjoyable. I quickly looked at the forecast and crossed the lock in Kremenchusko lake.Shortly into the first bay of the club with a lot of boat. Kremenchuskoe lake I was a bit afraid because the google satellite maps seems that there is not much shelter. However, and what the left bank of the estuary watching provides shelter its high coast. It's kind of a lean but with beautiful forests of white pine and small fishing villages like Golden Balki. City Tinjki has a large breakwater and I, thanks to good weather arrived near Cherkasy and dropped anchor in a small bay. 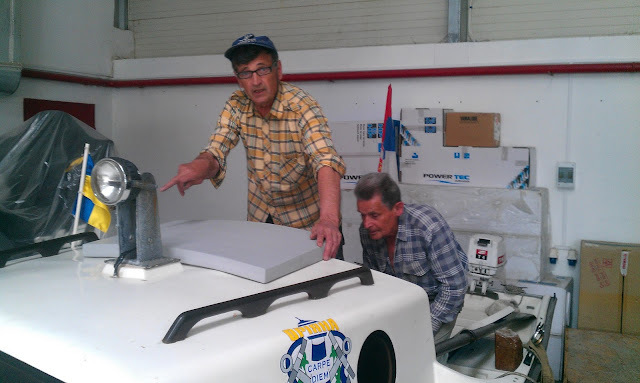 It is impossible not to mingle with fishermen because every tourist is here seen something new. The next day I enter in Cherkassy. And the city has a large breakwater and then beautifully decorated the marina with lots of boats, speed boats with hospitable people. In Cherkassy there are many people who like healthy lifestyle and a lot of them practiced sports activities on the water. Much like in Dnepropetrovsk and there is a great training ground devoted rowing with many beaches and smaller vessels can enter and in this water. After the bridge in Cherkassy Dnepr station again with tame beaches, islands, camps. At such a place at night and breathe full shallower in the forest of white pine. In the morning I come to Kanjiva. Places where you can moor in the harbor and near some shopping to do. Nearby is as small National Park and there is a hotel with interesting sculptures. Through Kanjivsku lock pass with communication via radio and kind lock operators help me more comfortable move in Kanjivsko lake and read me the weather forecast. Kanjivsko lake is beautiful, with high coasts, cottages and lots of places to rest. Half of the lake should be monitored watermarks in order not to become entangled in vegetation that is closer to the warm days growing rapidly. At the very end of the lake near the monument of World War II spend the night on the island near the town Balajka. Local fishermen host me and I eat local fish, eggs, soup and smoked fish. We toast with vodka and spend a great evening. Again Dnieper becomes tame and near the main almost tromilionskog city. A multitude of islands, bays, beaches where the ropes of people barbecue, small boats, fishermen. Coast of the Dnieper between the city Ukrainka, which also You can not moor a vessel and close to buy groceries, reveals a rich house. We can freely call the castles where the rich about Kijevo freely compete with the palace will be higher and overcome neighbor. The number of such villas is breathtaking and if I told you how many there you would not believe. It is best to explore them yourself and see the splendor, many beautiful canals and villas and oasis but also see the negative side of the transition and the big differences between rich and poor. Kiev the capital of Ukraine, on the beautiful river Dnieper. It also offers several marinas all that is needed the most demanding guest. It is recommended to moor a boat for river port Kiev and slowly walk the steep stairs to explore the city center and attractions. Since this is not a guide to the tourist sights of Kiev, which you can read online or buy a guide to travel agencies continue with information for boaters. In Kiev, the need to adhere strictly to the waterway as not to leave may result in a shock on the wall or stranding. There are three gas stations in Kiev. In center city then in club Chervonoj Kalin www.chervonakalina.com.ua/en/yacht-club/ and the third is ten kilometers upstream in Vyshhorod. There are luxurious and less luxurious marina but I finished this trip in the marina which has a heart and soul. The yacht club Oriyana in Vyshhorod. Although I crossed and the Kiev Sea and wanted to continue traveling to Belarus, Poland, Germany ... back to Serbia to draw a circle here is my journey for now ended because of administrative problems. Yacht club Oriyana - the reason to travel to Kiev! 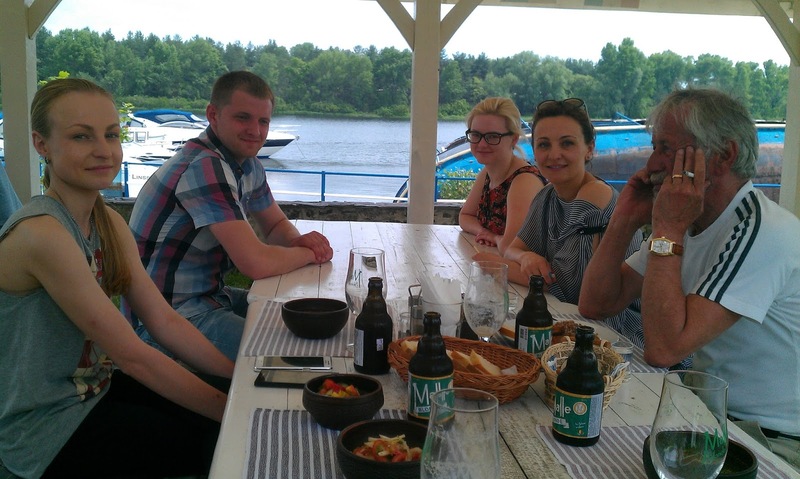 Yacht club Oriyana in Vyshhorod club is medium sized with a small tavern full of foreign flags and home cooking. www.oriyana.com The club caters to small boats and large yachts and all get together as one big family. Packed with the club interesting people from many different material, social status and everything looks like a small theater. Always something interesting going on night and day. 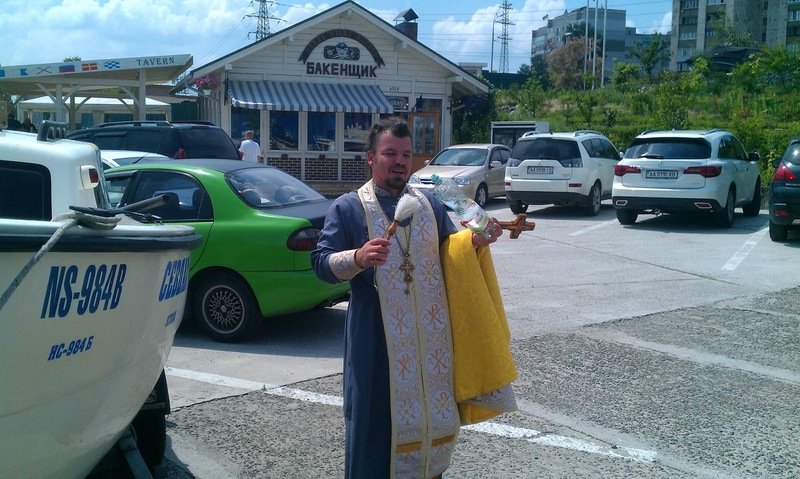 ...smiling personel with great cuisine at tavern..
...they made me new roof..
..spend time with nice ladies who tell me about kiev..
...lot of people who want to help..
...priest to bless my boat..
..so many nice open people.. The friendly and smiling hosts will try to fulfill your every wish and service center offers all kinds of maintenance and repair, and products and sails and awnings. There is a gas station and a new modern pontoons under construction. If you want to meet Ukraine in the best way and honestly sure I recommend this place. After six years traveling the world, I have found a place like this. The people, the atmosphere, warmth, openness, curiosity presents the true spirit of Ukraine. Just to see and feel this place is reason enough to embark on a new adventure and Ukraine meet and come just to this point. In case you cant download charts, please e-mail me on vanjayu@eunet.rs and I will send you. Here is my guide ends. With the sincere hope that this guide will inspire and encourage many people to set off the Dnieper to Kiev and later still, and with a desire for someone else to investigate and make a better guide for boaters, calm sea and pleasant sailing wish you the author of this guide, little sailor, Vladimir Papovic from Novi Sad on the Danube, Serbia. Any copying, unauthorized downloading of data sharing with other people, spreading among friends is welcome.